Stay on the lookout for the 2nd set in this EDUCATIONAL PEZ SERIES. It came out at the end of last year and has eluded our collectors. A common place to find these sets is at Wal-Mart. The next Presidential Set comes out in November. 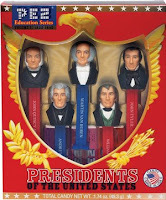 John Quincy Adams, Andrew Jackson, Martin Van Buren, William Henry Harrison and John Tyler.